It was fortunate for Diana that she was a natural beauty as she had little otherwise to enhance her looks: her dresses were made by her mother’s lady’s maid rather than by one of the fashionable court dressmakers….Though not at all vain, she was by now sufficiently accustomed to male admiration to have plenty of confidence in her appearance. … Young, happy, glowing and friendly, Diana was an instant success…. 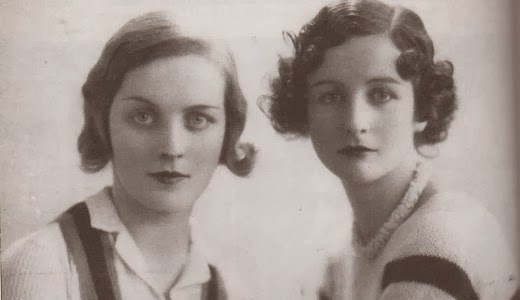 observations: Diana Mitford (later Guinness, then Mosley) was by all accounts not just the most beautiful of the famous Mitford sisters, but an outstanding beauty by any standards. 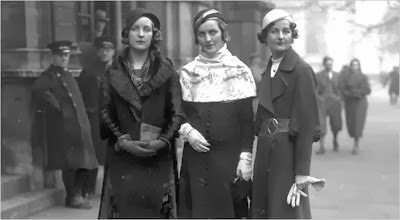 But if you look at the photos above, of her with her sisters, I don’t know that this comes over - most people surely wouldn’t pick her out as the astonishing beauty who outshone all the others: she is in the middle of the top photograph, and on the left of the lower one, with Nancy to the right. But for once you’d be sure that it’s the photos that lie, given the complete unanimity of contemporary opinion – is it something to do with those huge eyes, which look slightly weird in photos, but were apparently mesmerizing in real life? 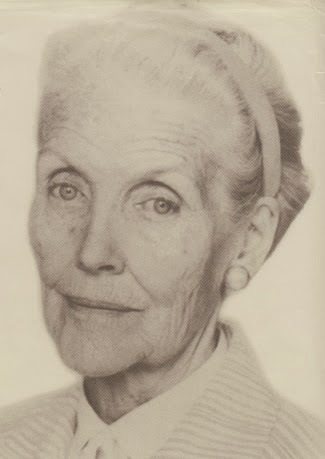 And then when you see photos of her in old age, you can totally see how lovely she must have been - all that beauty page blah about bone structure, and about beauty living into old age. --this is her in her 90s. She knew everyone in the 1930s, and was greatly loved, and desired: many claim her as a muse or inspiration. At 18 she married Bryan Guinness, heir to the brewing fortune - she is the original of this favourite anecdote: she was fiddling with her veil, prior to her huge society wedding into one of the richest families in the UK, herself an Hon, and her Nanny said ‘don’t worry darling, no-one will be looking at YOU’. She had two sons, and must have seemed to have the perfect life: rich, beautiful, desired, everything at her feet. But she left her husband for fascist leader Oswald Mosley – even though at that time there would have seemed no chance that he would ever be able to marry her. (He was already married, and still had feasible political ambitions, so could not get divorced.) Guinness plainly adored her – there exists a deeply unhappy letter he wrote to her to try to persuade her not to leave him. She theoretically stepped outside society: although she could not live with her beloved, the sin was overt. Mosley’s wife died unexpectedly, and the happy couple were now able to marry, in a ceremony at the Goebbels’ house in Berlin attended by Hitler. The marriage was kept secret: a by-product of this was that Diana’s younger sisters still couldn’t visit her – although she was now theoretically respectable, people didn’t KNOW she was, so the sisters still had to be kept away from the imaginary taint. She and Mosley were imprisoned without trial during the Second World War, their loyalty in doubt. She was understandably put out about this, although you do long to ask her what she thinks would have happened in similar circumstances in her much-admired Nazi Germany; and whether (just to take a small example) she and her husband would (in this theoretical Berlin imprisonment) have been able to launch, and win, a libel action from jail, as the Mosleys did in London. Eventually the Mosleys moved to France for good - this entry takes a look at one part of their lives, their friendship with the Duke and Duchess of Windsor. She was a very good writer – this entry was inspired by looking at one of her books last month on the blog. She was very beautiful at 90. Her story is very interesting. Maybe one day I will read more about her. She pops up a lot in any histories or biographies set in the UK around that time - and I would always read any book about her. I don't know why I'm so fascinated by the family, and I'm not a great one for titles and aristocracy normally, I'm quite bolshy and democratic. But the Mitfords intrigue me. Moira - You can tell just by the way her head and eyes are moulded that she was stunning. And it seems she had a really interesting life, too. Yes indeed to both. So beautiful, so well-connected, and so close to the great events of her time. She is believed to be the only person who knew both Winston Churchill and Adolf Hitler personally. Love all thnigs Mitford. Esp Nancy's novels In Pursuit of Love and Love in a Cold Climate. Oh me too - I think I've read every book written by or about them, I am in hopeless thrall to the whole family! But yes, the two you mention are the very best - desert island books.